Halloween is right around the corner, and even though getting candy and having the best costume in the neighborhood is a big deal, safety should be a number one priority. As a parent, you may be wondering how you can keep your little ones safe this Halloween. Luckily, in this blog, we are going to refresh your memory with some essential tips to remember when your kids go trick-or-treating this year. When going door-to-door with your little princess, superhero, or ghoul this Halloween, be sure to keep the following tips in the room. Before the streetlights come on the night of trick-or-treating, be sure to have a route established. Discuss with your little ones where you will be going and how many houses you plan on visiting. Try to choose a well-lit, familiar neighbor, preferably one with sidewalks or one that closes their streets in spirit of the night! This seems like a no-brainer, but be sure to supervise your children throughout the night. Tag along in the fun, but also allow your kids to safely explore their world and grow their independence skills. Allow younger children to take initiative by ringing the doorbell and saying “Trick or Treat!” to get candy in return. For older children, you may choose to wait on the sidewalk while the children fill their bags with candy. If you choose to trick or treat at night, be sure to take the necessary steps to ensure the kid’s costumes are visible. Have them carry flashlights or allow them to wear glow sticks. Additionally, reflective tape can be put on their clothing or costumes. Be sure to drive slowly, especially when in busy neighborhoods, and follow traffic signals and the rules of the road. Exit driveways with extreme caution. Make sure that your children get out of the vehicle on the curbside, rather than the side with traffic. Always be on the lookout for children in the street and on cross paths, some children may dart out in front of you without realizing it! Make sure to always cross at the corner. Stop at all street corners and stay together in a group before crossing. Cross streets at the corners, use crosswalks, and never cross between parked cars. Remind your children over and over again to look both ways before crossing the street. 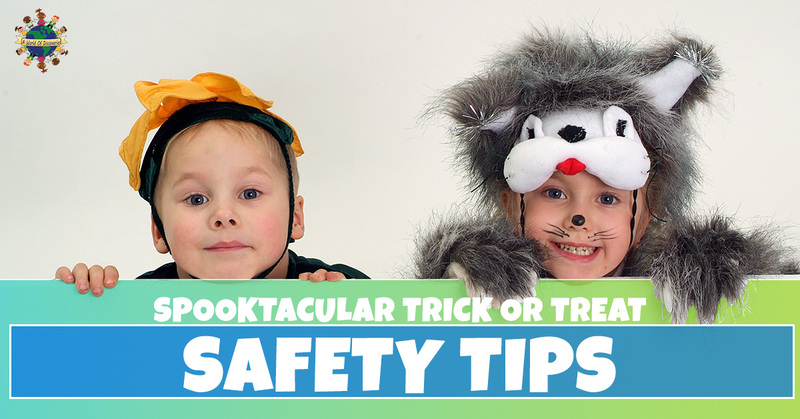 By following these tips, your child will have a safe a fun Halloween! Remember, when you’re looking for a home daycare in Columbia, Missouri, contact A World of Discoveries Daycare! ©2015 Marketing 360® Do not copy. All rights reserved.